I managed this one Tuesday, and failed to get it out of the camera. 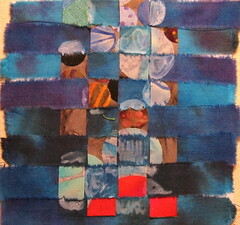 The center is a piece of fabric with circles fused to it, woven into strips of hand dyed blue. I tried to accentuate the circles with bleach pen on the the blue strips, but it didn’t work very well. I don’t think it didn’t work out very well, I like this one a lot!